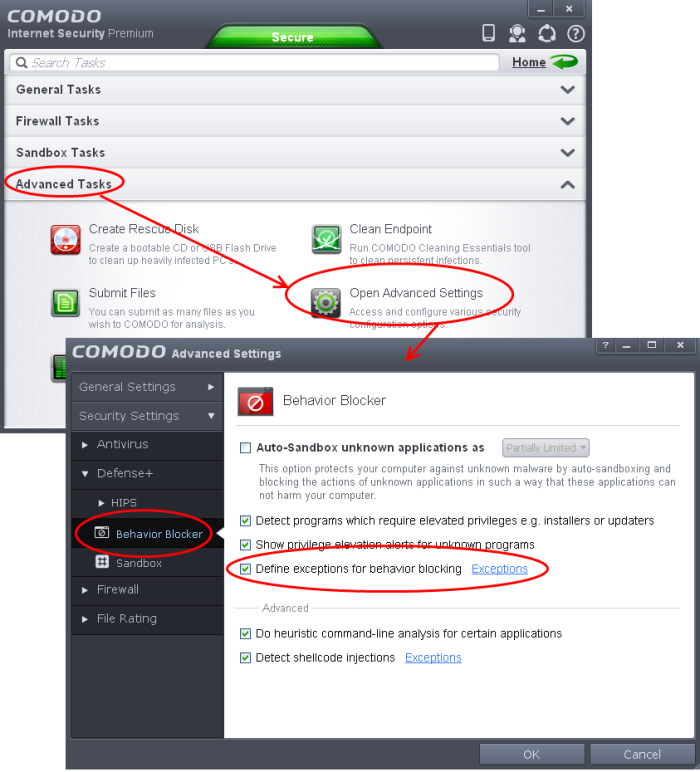 Behavior Blocker will auto-sandbox run unknown executables and queue them for submission to Comodo Cloud scanners for behavior analysis. Users do, however, have the option to exclude specific files or file types from this auto-sandboxing process. This is particularly useful for developers that are creating new applications which, by their nature, are as yet unknown to the Comodo safe list. 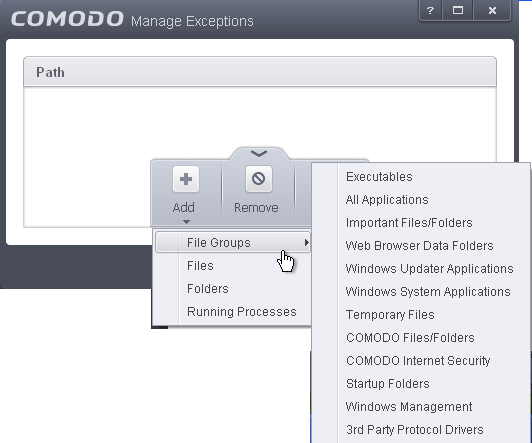 The Manage Exceptions interface will open. Click the handle from the bottom and choose 'Add' from the options to add the files/executables to be excluded from monitoring by Behavior Blocker and Auto-Sandboxing. Files - Opens the 'Open' window and enables you to navigate to the application or file you wish to add. Folder - Opens the 'Browse for Folders' window and enables you to navigate to the folder you wish to add. Click 'OK' in the Manage Exceptions interface. Click OK in the Advanced Settings panel for your settings to take effect. 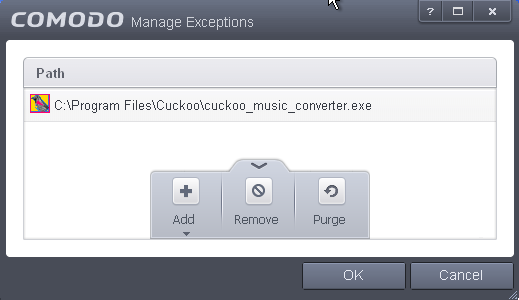 The selected application will not be auto-sandboxed on its execution. Disable Behavior Blocker by de-selecting the 'Enable Auto-Sandbox unknown applications as' check box in the Behavior Blocker settings panel. Not recommended. For more details on Auto-Sandboxing process, refer to the section Unknown Files: The Auto-Sandboxing and Scanning Processes.